It’s about a quarter to four on 15th April 1989. I’m on my own in the place where I was living then. A Saturday afternoon, working on songs, doing my music while everyone else is out. But my mind is not entirely on my music because I know that Liverpool, Liverpool Football Club, are playing in the semi-final of the FA Cup, against Nottingham Forest, at Hillsborough, in Sheffield. So, around half-time I turn the radio on to hear how they are doing. For some years now I’ve been telling myself I don’t particularly care how they are doing. That football’s not that important to me. 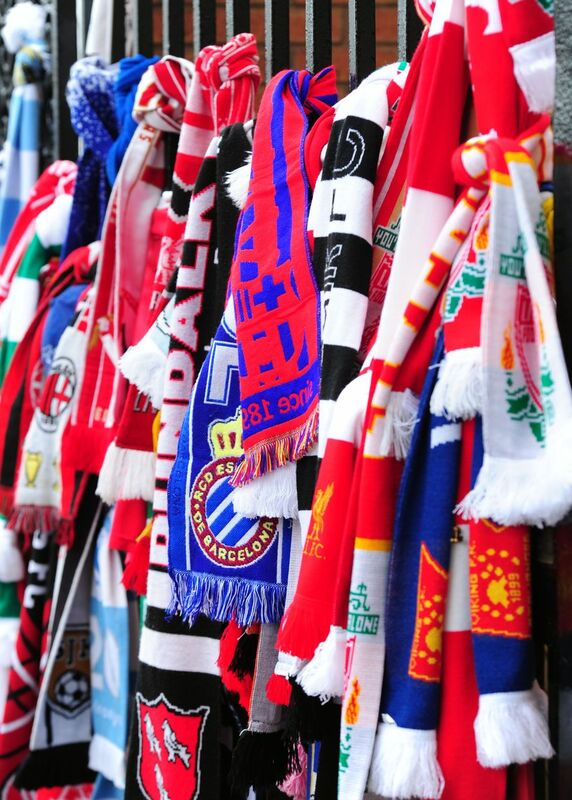 That, in fact, in these difficult 1980s where all Liverpool’s had going for it has been the successes of Liverpool and Everton, football has become an ‘opiate of the masses.’ But, despite this Marxist thinking, I always know how they’re doing. I always know where they are and who they’re playing. And I always know what time they’re kicking off. 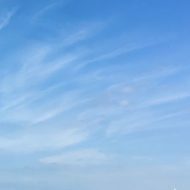 I’m from Liverpool, you just do. Which is why I turn on BBC Radio Merseyside at a quarter to four on 15th April 1989. To hear how they’re doing at half time. And I immediately drop into the great tragedy of Liverpool, and of our our time, in this place. From then on it’s leave the radio on. It’s Roger Phillips, blessed Roger Phillips. It’s like he’s broadcasting for the next 24 hours, 36 hours. Taking calls. Listening for the city. Who’s safe, who’s found, where are they, did you see them last, who’s lost, who’s dead? 95 on the day. 96 soon after. Crushed. Gone to a football match. And never came home. Twenty five years go by and then it’s now. 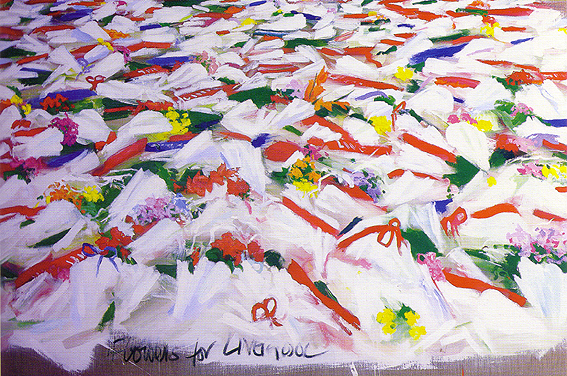 ‘Flowers for Liverpool’ by Adrian Henri. And we get blamed. Of course we do. We’re rough sorts and we’re hard to like in polite company. A scum newspaper blames us. The police blame us. The government blames us. Football people don’t blame us though. Not for a minute. They’ve been in the place where we were crushed. The year before, or the year before that. There and many another similar places they just about got out of alive. Unlike the 96. Life and dying would inevitably have happened to some of them since. But if you scan down their ages back then, most of them would probably have been watching us beat friendly, competitive and dignified Manchester City this last Sunday. 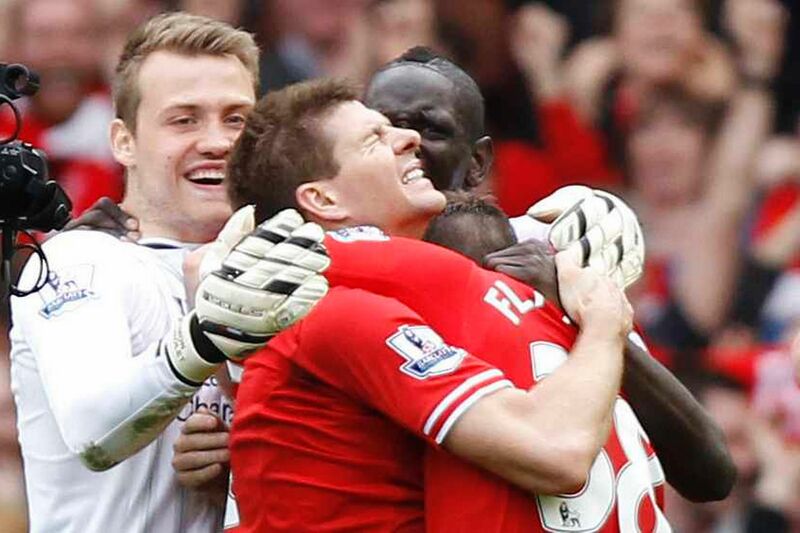 And most of them would have watched our Steven gather the players together at the end and talk about the next match. About Norwich. Most of them would have been alive to join in the joy and excitement of seeing us maybe being about to win the League. To win the League for the first time in 24 years. Since just after they died. Most of them. It’s not just about football. We all know that. We’ve heard the truth and we’re waiting for justice. But we miss them. Every one of them. And the lives they would have led. 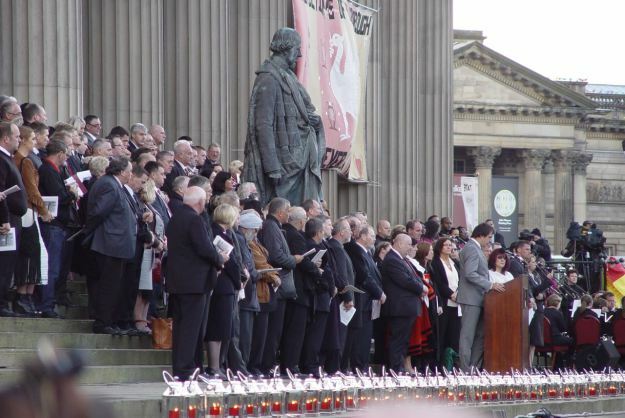 The families of the 96. September 2012. The day we got the truth. tears dried by the April wind. long after the light had gone. What has always puzzled me is just why the police went so far with the cover up….it makes me think that top level police moral corruption was more widespread much earlier than I had imagined. In fact it seems to have been a case of top level moral corruption for over two decades at the heart of the British establishment, not just the police. 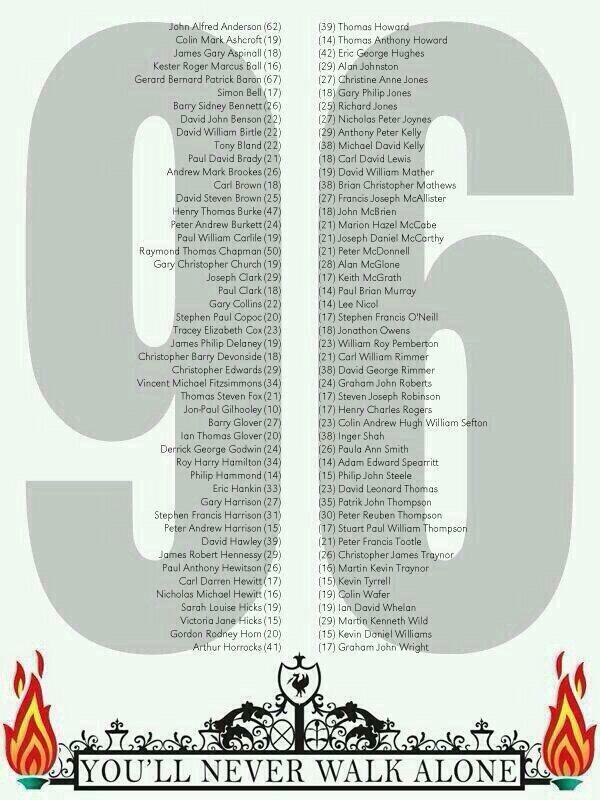 Only love and fury must have kept the families of the 96 going for all that time and through all the obstacles and discouragements placed in their way. By the West Yorkshire police, the legal establishment, the Thatcher government and the subsequent Labour governments. The shadow it cast on Liverpool was serious and felt by us all. But not so much as the 96 families felt. And now I think we all feel we have the truth. Though the wheels of justice seem to be turning slowly and very reluctantly. What a tragedy and stain on the whole country. 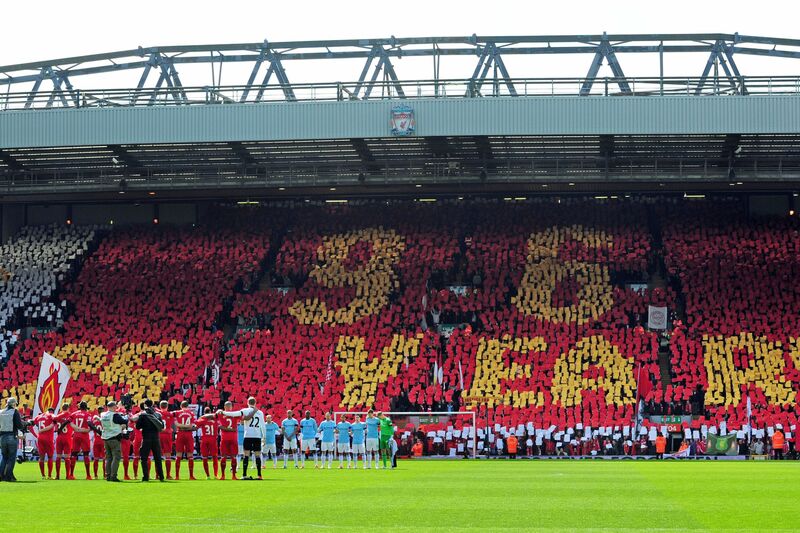 I am really sad this happened, but am glad to know the 96 will not be forgotten. They live on in the hearts and minds of people like you. Thanks for bringing this to light, to the rest of the world who might not have been tuned in to this turn of events. Thank you Jan. Tomorrow 26,000 people will gather for a service at Liverpool’s football ground, as they do every year, to remember the 96. And my nearly 86 year old Dad will be there. He always is, as 2 friends of his lost a son at Hillsborough. It’s that close for all of us. I think everyone in Liverpool knows someone who lost someone. I am thrilled that your Dad will be there, but sorry that his friends lost their son. Terrible. Yes, California needs to know about this travesty.